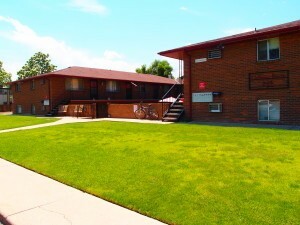 1443 Centennial - RENTED | Robinson Investment Company, Inc. Standing in Living Room, Kitchen to the left, Stairs go down to Front Door. Unit C includes a washer dryer in the kitchen. Unit C Kitchen looking toward hall to bedrooms. 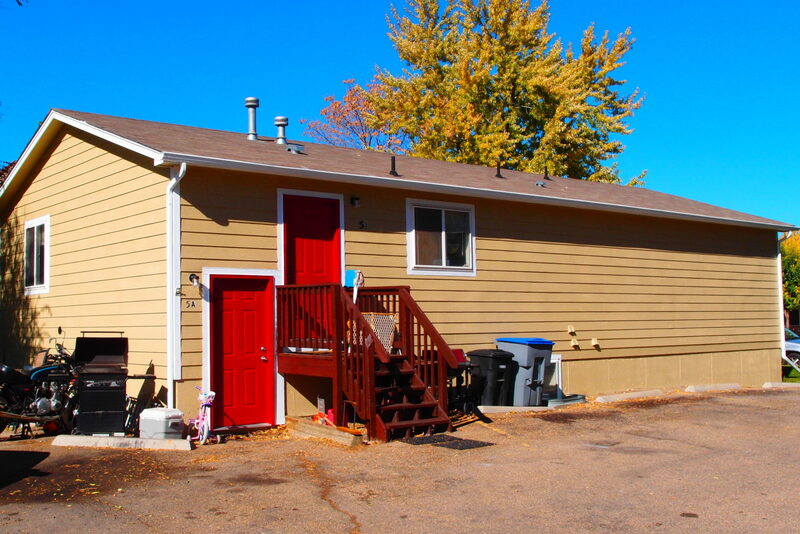 Spacious 3 bedroom 2 bath triplex. 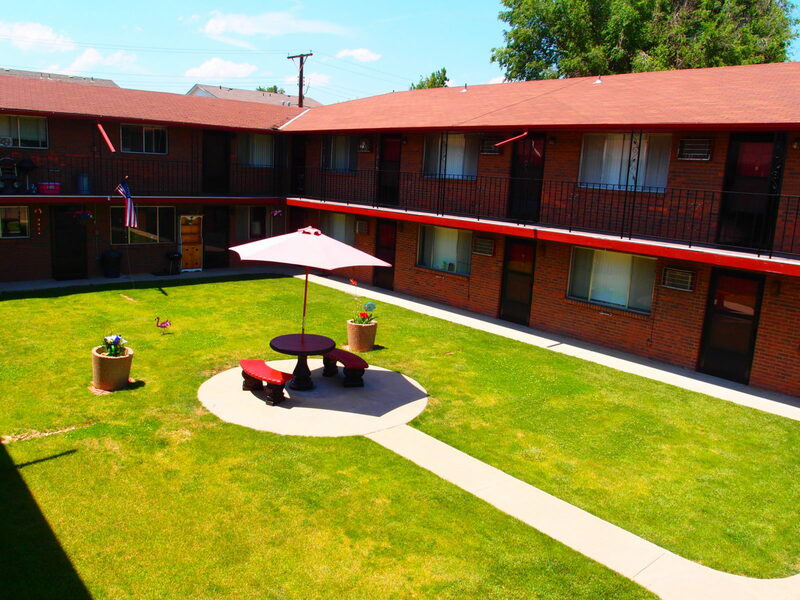 Each unit is a single story, unit A at the garden level, unit B at the mid level, and unit C on the upper level. Rent is $1225 and the deposit is $1225. Utilities are not included. Please note that we do not accept Section 8, we do perform a criminal background check and we require employment to show the ability to pay rent. 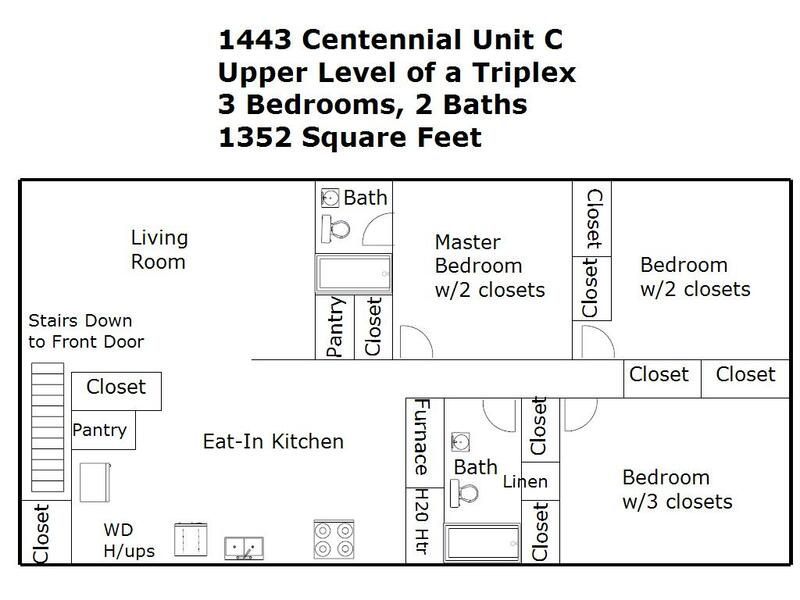 Unit C is located on the upper level and features lots of natural light with a spacious eat-in kitchen. The kitchen includes a dishwasher, washer, dryer and 2 pantries. 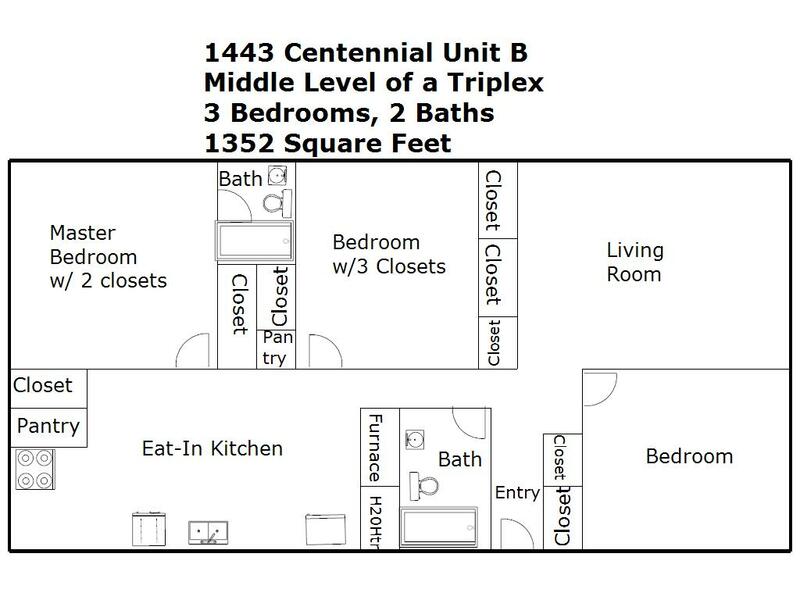 All 3 bedrooms are large. The master bedroom has 2 closets plus a full bath. The second bedroom has 3 closets and the third bedroom has 2 closets. The second full bath is also nice-sized with a linen closet and tub. Unit B is on the middle level and is also very bright and airy. The spacious eat-in kitchen also features a dishwasher and 2 pantries. 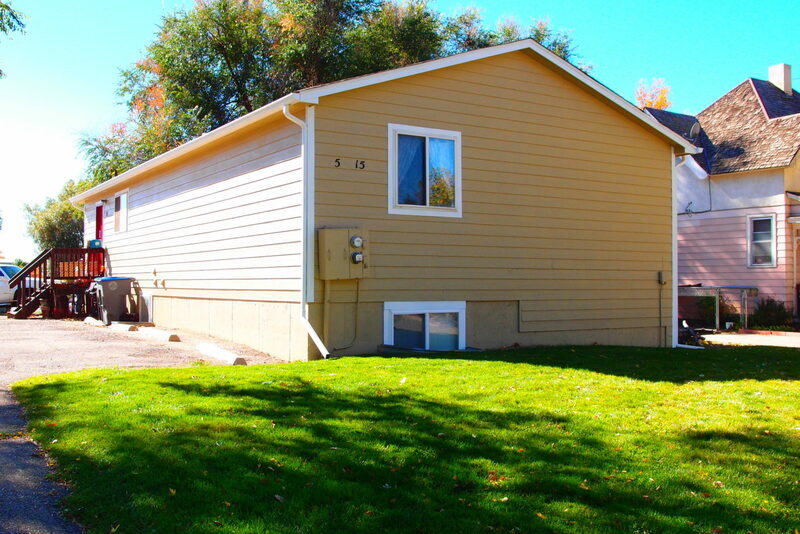 All 3 bedrooms are large and include lots of closet space. The master bedroom has its own master bath and the second bathroom is also a full bath with tub. 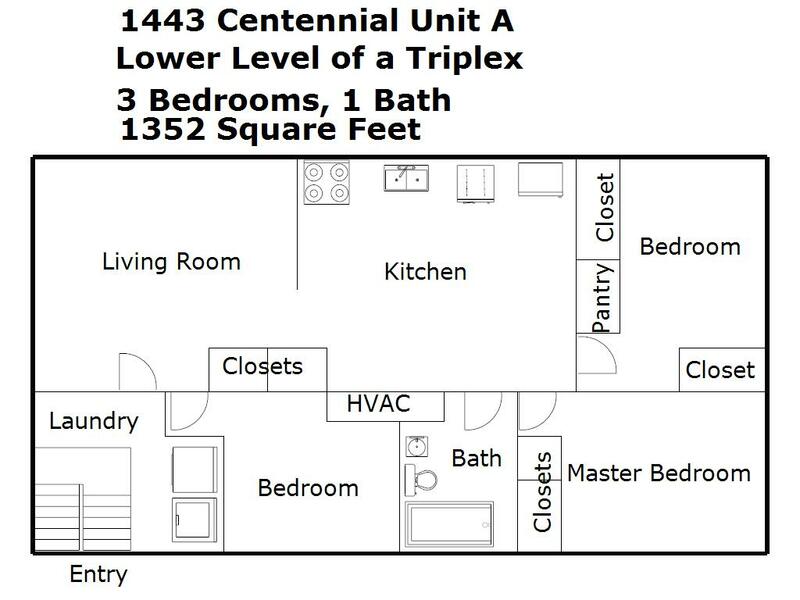 Unit A is on the lower level and also includes a large kitchen with dishwasher, 3 bedrooms and 1 bathroom. Unit A also has a washer dryer. Each unit has its own furnace and hot water heater and is 1352 square feet. 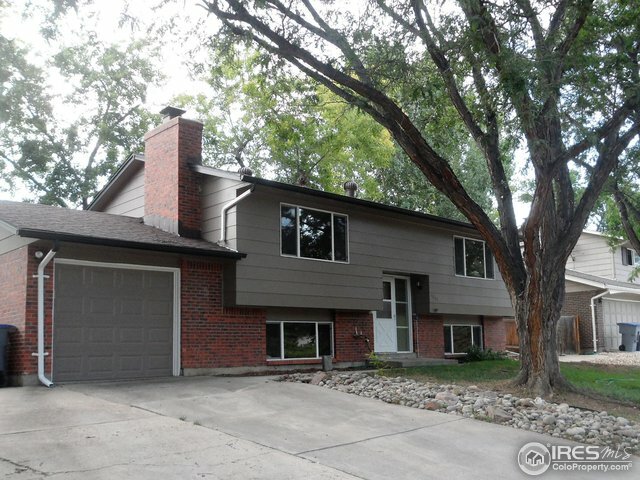 Located on a cul-de-sac with plenty of off street parking. 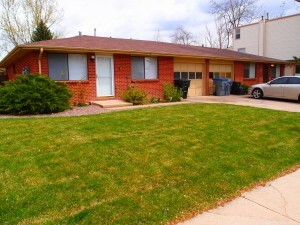 This property is in walking distance to Spangler Elementary and the Longmont Athletic Club.